Clare won their first ever Bank of Ireland SFC qualifier as, helped by the sharp shooting of corner forwards Denis Russell (1-06) and Michael O’Dwyer (0-05), they brushed aside Sligo 1-15 to 1-07 at Cusack Park, Ennis. The sides were level, 0-7 to 1-4 at the break – Sligo's 13th minute goal coming from corner forward Michael McNamara. But Clare stepped up a gear in the second half. They went three points in front thanks to a fisted Russell goal after the restart and, with O’Dwyer limping off, Kilkee marksman Russell finished off the job, pointing frees from 55 and 45 metres to seal a famous victory. Sloyan had pointed a first for lacklustre Sligo on nine minutes. Four minutes later he saw his shot batted away by goalkeeper Dermot O'Brien, only for McNamara to pounce on the loose ball and bury the ball to the net. Kilmurray Ibrickane forward O'Dwyer crowned an excellent first half as he hammered over four straight points before Kieran Quinn, McNamara and Gerry McGowan (free) brought the sides back level at 1-04 to 0-07 at the interval. 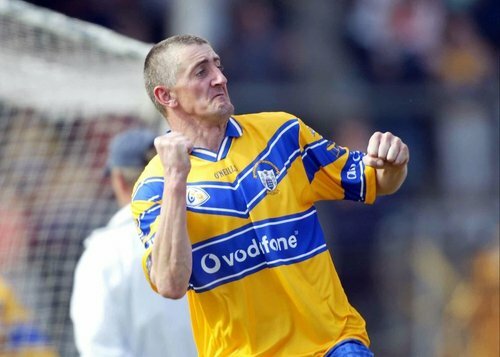 McGowan struck again in the second half but only after Russell had fisted home Clare's goal, a moment of magic as O'Dwyer danced along the end line before spotting the unmarked Russell. A goal in front, Clare struck off points from Eoin Coughlan, Liscannor half-back Alan Clohessy and O'Dwyer again, before he had to go off. Substitute Martin Brehony and McGowan kept Sligo in the hunt but living off just three points in the second half, it was never to be.